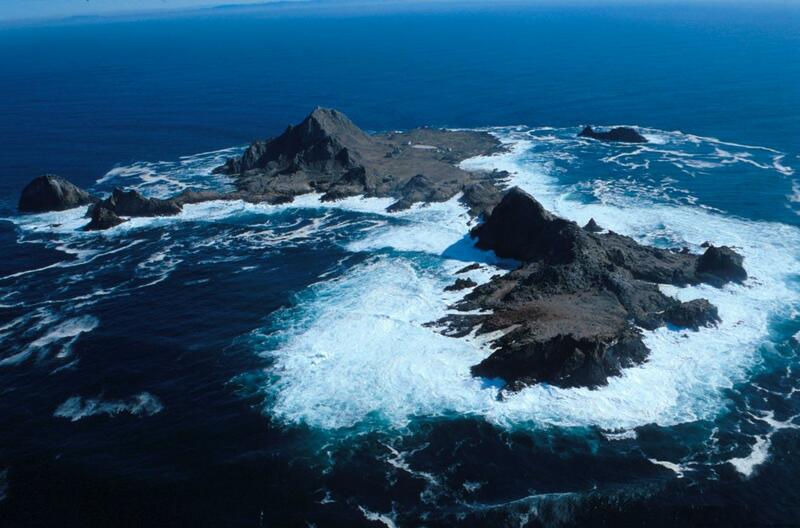 The Farallon Islands are a National Wildlife Sanctuary just 27 miles off the coast of San Francisco, where millions of birds and marine animals are legally protected. Plans of the US Fish and Wildlife Service (USFWS) to aerial bomb 1.3 metric tons of rodenticide to kill mice on the Farallon Islands originated over 5 years ago. The stated purpose of this project was to protect the ashy storm petrel, a legally protected species of concern. The mice are not a direct threat to the petrel. Rather, USFWS claims that another legally protected species of concern, the burrowing owl, eats the chicks of the petrel when the population of mice dwindles. Because the average population of burrowing owls on the Farallons is said to be only 6 burrowing owls, the scale of their predation of petrel chicks seems minimal given that their preferred prey is mice. USFWS theorizes that if the mice are killed, the burrowing owls will leave the Farallons. This rather fanciful scenario is less credible than the more likely outcome that the burrowing owls will either be killed by the poison or eat yet more petrel chicks if their mice diet is eliminated. Aside from the convoluted and questionable rationale for this project, the main concern is the anticipated collateral damage caused by aerial bombing huge quantities of rodenticide (brodifacoum). The planned rodenticide is an anti-coagulant that is highly persistent and causes all vertebrate animals (mammals, reptiles, birds, fish, etc.) to bleed to death. Death is not quick; the poisoned animals stumble around before dying and are easy prey for other animals that are then killed by the poison. Dead, poisoned mice are equally attractive food for some birds. The poison pellets are also as appealing to other animals as to mice. Even the supporters of this project readily admit that many animals other than mice are likely to be killed directly by the rodenticide or as secondary victims. “Stuff happens,” they say with a shrug. The author of the Environmental Impact Statement is the same organization—Island Conservation—that will implement the project, if and when it is approved. This conflict of interest seems one of many unwise decisions made by US Fish and Wildlife Service. The opposition to this project has been loud and clear. Maggie Sergio, who reported this project on Huffington Post, published a petition in opposition to the project that was signed by over 32,000 people. And many prestigious organizations including the EPA, American Bird Conservancy, City of San Francisco, The Ocean Foundation, and several retired USFWS scientists, have also criticized the project. Yet, five years later approval of the Revised Draft Environmental Impact Statement is still pending. Theoretically this project is still alive. The Farallons project has always seemed to us so ill-advised and misconceived that we could not believe it would materialize. We have therefore not covered it since 2014 when we republished Maggie Sergio’s Huffington Post article and asked people to sign her petition. Unfortunately, we were under-estimating the power and influence of the supporters of this project. Bay Nature, a local nature magazine, recently published an article about the Farallons project and island eradications in general. That article seems to assume there is consensus that mice must be eradicated on the Farallons and that the only question is the method that will be used (more about Bay Nature’s proposed method later). And the California Invasive Plant Council (Cal-IPC) has published an endorsement of island eradications—including the Farallons—in its most recent newsletter (available here: Cal-IPCNews_Summer2016). Cal-IPC’s preferred strategy for eradications is aerial application of rodenticide. Therefore, our concern about the proposed Farallons project has once again been elevated to crisis levels. When two local organizations, which claim to advocate for conservation endorse the Farallons project, we must take it seriously. Since learning about plans to eradicate mice using rodenticides, we have learned that the practice originated in New Zealand, where poison applications began over 60 years ago to kill a wide range of non-native animals. Bill Benfield tells the entire story of eradications in New Zealand in his book, At War With Nature. (1) We have relied on that valuable resource for this article. That history is relevant to us because there are some striking similarities between the North American and New Zealand versions of invasion biology, the ideology that drives eradication attempts in North America and New Zealand. The moa was a huge flightless bird that was hunted to extinction by Polynesians when they occupied New Zealand. Humans occupied New Zealand more recently than their arrival in North America. 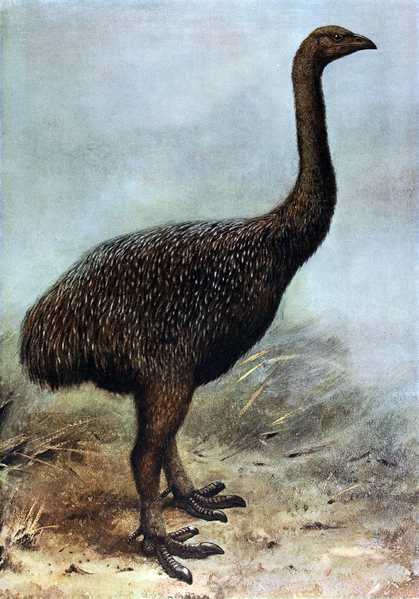 Prior to their arrival, New Zealand was inhabited by many flightless birds that were successful because they had no predators. The moa was the largest of those birds. Although it has been extinct for hundreds of years, palaeontologists tell us the moa was about 12 feet tall and weighed about 500 pounds. It was easy prey for the first humans who arrived in New Zealand about 800 hundred years ago from Polynesian islands. As most sea-faring humans do, they unintentionally brought with them a species of rat, the kiore. The climate of New Zealand is much colder than the Polynesian home of the first humans and their agriculture was not well suited to the climate of their new home. The moa quickly became the main source of food for the humans. The moa were rapidly driven to extinction by hunting, which forced the humans to retreat to the northern end of New Zealand where the climate is milder and their agriculture was more successful. Although there is some debate about the size and range of the moa population, Dr. Graeme Caughley reported that the moa population was very large and widely spread, based on a calculation of the available sustainable bio-mass. He believes moa populations existed in all vegetation types, including forests where they would have browsed the forests. Intense browsing of the forests would have encouraged the growth of the slower growing and unpalatable browse-resistant trees that became the forest giants. The faster growing species of trees were the palatable browse- tolerant species that were held back by browse, allowing the growth of slower growing trees that would in time become the forest giants. The moa also would have spread the seeds of the trees they ate and inhibited the growth of an understory. In other words, the forest that humans found when they arrived in New Zealand around 1200 AD was adapted to the big population of moa. In the absence of moa the composition of the forest quickly responded to the absence of browsing. Fast growing trees that were formerly held back by browse were no longer at a disadvantage compared to slow growing and unpalatable browse-resistant trees; the forest under-story became denser. The composition of the forest that was found by Europeans when they arrived in New Zealand several hundred years later was in transition. The first humans on New Zealand did not have a written language. The landscape they found when they arrived is not recorded in history and is only known to the extent that archaeological and paleontological evidence is accurately used to reconstruct it. As all human science does, these disciplines are continually evolving and therefore did not inform the earliest versions of ecology that spawned the eradication movement on New Zealand. 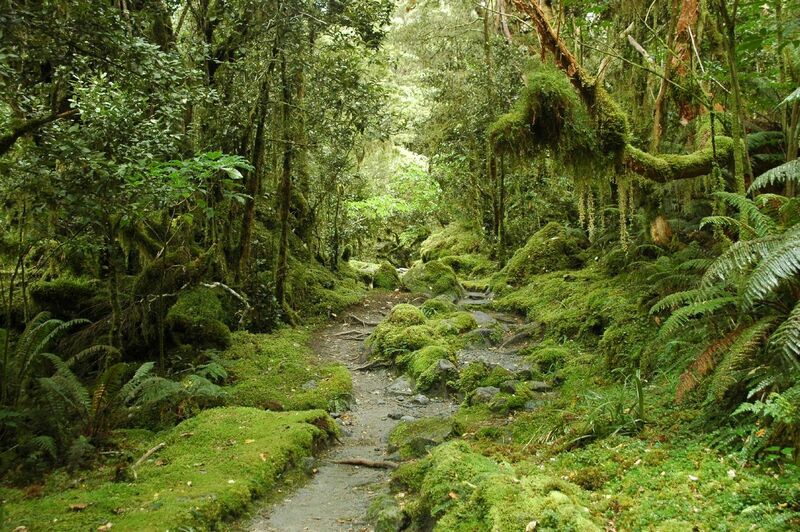 In other words, the forest found by Europeans when they arrived in New Zealand is still considered the pristine ideal that ecologists wish to replicate. In fact, that landscape was just as modified by human habitation as any modern, “novel” ecosystem. This fantasy of a pristine, pre-human landscape is similar to the fantasy in North America that the landscape found by Europeans when they arrived on the East Coast in the 16th century and the West Coast in the 18th Century was the “natural” landscape, unaltered by humans. They are just as mistaken in that assumption as they are in New Zealand. Native Americans actively managed the landscape to serve their horticultural and cultural needs. The consequences of that fantasy have been just as deadly and destructive in New Zealand as they have been here in California. Europeans brought many animals with them to New Zealand, just as they did to North America. They brought both domesticated animals such as sheep and wild animals such as deer that they could hunt. The deer browse the forest, just as they do here, and the impact they have on the forest is similar to the impact moa had on the forest. 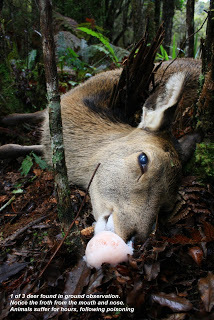 The deer and other browsers are the functional substitute for the extinct moa. Fast growing palatable species of trees are disadvantaged by browsing and these are the trees that early ecologists considered the “natural” forests of New Zealand because they were the trees that were found when Europeans arrived. Hence, aerial poisoning of the land began over 60 years ago to kill all browsing animals in New Zealand except domesticated animals kept behind fences. Smaller non-native animals such as possum are also targets for eradication because they are assumed to be predators of the few flightless birds that remain in New Zealand. This accusation is refuted by Bill Benfield who tells us that possum are primarily vegetarians and that a study of the contents of possum stomachs found no evidence of bird predation. Possum are also accused of being carriers of bovine TB, a disease that infects domesticated animals. However, recent laboratory tests find no evidence that possum are infected with bovine TB, beyond minute levels. In any case, the possum population is small because it is a species that rears only one pup per year, so its population would grow only slowly if they weren’t being exterminated in New Zealand. 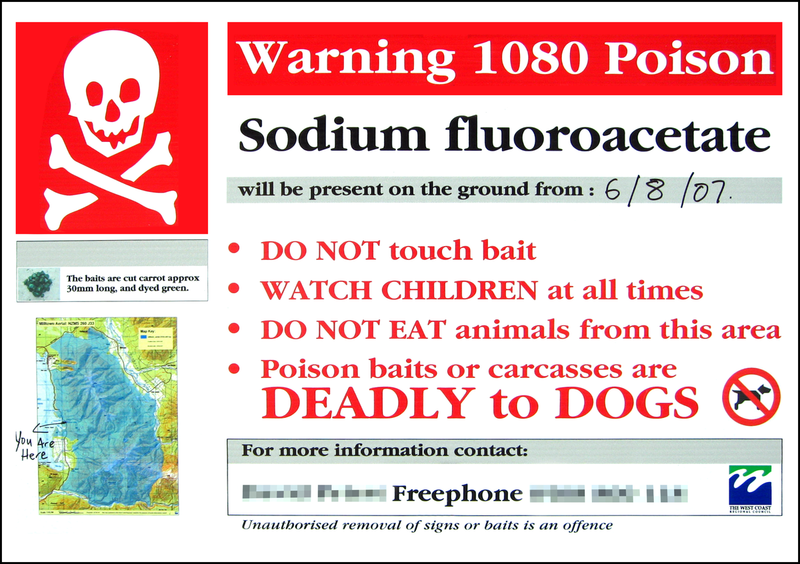 A different poison is used in New Zealand–called Compound 1080–that operates in a different way than anti-coagulant rodenticide. It kills indiscriminately any life form that requires oxygen. It was developed as an insecticide in Europe, and was initially used in the US where it was briefly used to kill coyotes and other wildlife considered inconvenient predators until its use was severely restricted because of its extreme toxicity. It is entirely banned in California, which is why our local version of island eradications use anti-coagulant rodenticide instead of 1080. 1080 is a slow, grisly killer of EVERYTHING: insects, fish, mammals, birds, amphibians, etc. It is just as likely to kill native animals as non-native animals and it does. This indiscriminate killing of every living thing in New Zealand was described in chilling detail by Elizabeth Kolbert in the New Yorker. It is also visible in the videos of the Graf brothers for those with a strong stomach. HERE is one of many of their videos. We could turn a blind eye to what is happening in New Zealand if this strategy were not being exported all over the “civilized” world. Amazingly, such island eradications have happened in many places and are being proposed in many places where local resistance is trying to prevent them from being implemented. What have we learned from the projects that have been done? The record is sketchy because very little after-the-fact monitoring of completed projects has been done. What we DO know, suggests that it is not in the interests of the promoters of these projects to monitor the outcome of their projects because the results are consistently deadly and unsuccessful. Readers of Million Trees will not be surprised to learn that killing one species does not magically “restore” an ecosystem to some historic ideal because ecosystems are very complex and their occupants live in communities with many, complex interactions that are not perfectly understood by humans, even humans calling themselves invasion biologists. There are many other factors that prevent the re-creation of historical landscapes, such as climate change. There are undoubtedly many factors that are not known to us, which prevents us from “fixing” something we do not understand. In any case, many of us don’t consider it necessary to “fix” something that we don’t consider broken. In those few cases when after-the-fact monitoring was done, there is considerable evidence that many non-target animals were killed and the water was polluted. In the case of Rat Island, off the coast of Alaska, no monitoring was planned after the aerial bombing of 46 metric tons of anti-coagulant rodenticide to kill rats. However, neighbors of Rat Island demanded an investigation when they saw dead birds and animals floating in the vicinity of the island after the project was done. That investigation (available HERE) was done by USFWS Law Enforcement. The investigation found that the manufacturer’s recommendations regarding dosage were exceeded, that instructions to collect dead rats so they would not be eaten by birds were not followed, and that hundreds of birds died, including many legally protected bald eagles. The investigation was not done until 7 months after the project was completed. We should assume that the number of dead animals found would have been greater if the investigation had been done promptly after the project was completed. The most damning evidence of all is that after killing untold numbers of animals, including those not meant to be killed, and poisoning the environment with a deadly toxin that bioaccumulates and persists in our bodies, the rat population often returns to pre-project levels within a few years. 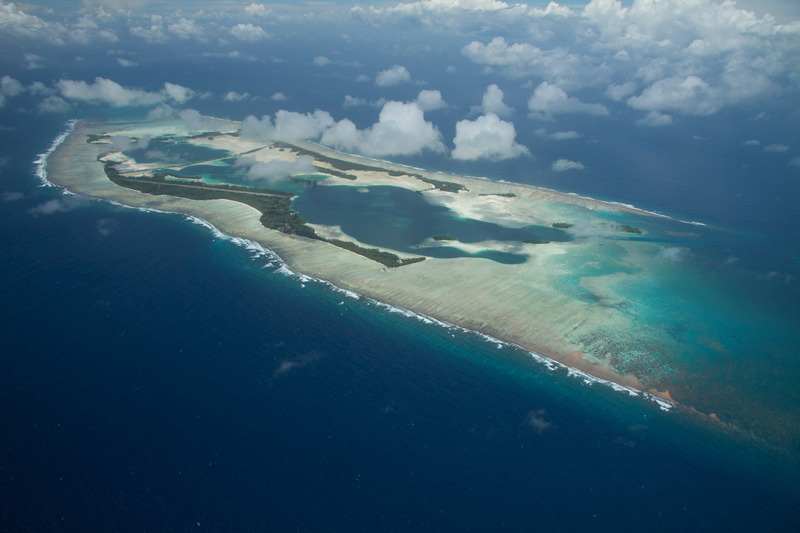 Henderson atoll in the Pacific is an example of such a failure. Eighty tons of rodenticide pellets were aerial bombed on Henderson in 2011. Apparently, at least two rats survived, one presumably male and one presumably female. Within a few years the rat population had returned to pre-projects levels of 50,000 to 100,000 rats. The rats were said to have been introduced to Henderson over 800 years ago. Surely they had reached some balance between population size and available food sources. Rats are an ancient species that would not be here if they completely wiped out their food sources. Rat population growth is modulated by available food sources. Hence, when almost completely eradicated, the rats rapidly reproduced back to equilibrium with food sources. Claims that the Henderson project was urgently needed to prevent the extinction of a bird species with which rats had co-existed for over 800 years were bogus. If rats had not exterminated the birds within 800 years, they weren’t likely to do so before this pointless project killed tens of thousands of animals, probably including many birds. Like most “restoration” projects, claims are made about a conservation crisis that is often just an emotional appeal without any scientific basis. Money is raised and spent in response to these fabricated crises and many “non-profit,” untaxed organizations subsist on these campaigns. 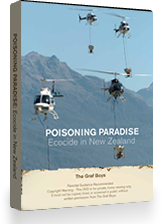 In the case of New Zealand, the poison they are using is manufactured by the government, creating an unholy financial incentive for these eradication projects. The failure of the extermination attempt on Henderson is not an isolated incident. Lehua is one of the Hawaiian islands on which extermination was attempted and failed. An evaluation of that attempt was published in 2011 to determine the cause of the failure so that a subsequent attempt would be more successful. That evaluation included this report on the success of similar attempts all over the world: “An analysis of 206 previous eradication attempts against five species of rodents on islands using brodifacoum or diphacinone is presented in an appendix to this report. For all methods, 19.6% of 184 attempts using brodifacoum failed, while 31.8% of 22 attempts using diphacinone failed.” Brodifacoum and diphacinone are both anti-coagulant rodenticides. Diphacinone is considered less toxic and less persistent than brodifacoum. The “restoration” industry is meeting with a great deal of public opposition. Because some of the opposition is based on concerns about polluting the environment with pesticides–such as herbicides used to kill plants and rodenticides used to kill animals–the “restoration” industry is looking for a less controversial method of accomplishing their deadly goals. It seems that destructive “restoration” techniques are developing faster than human common sense can keep up with. What can we do to slow it down? What can we do to prevent the pointless poisoning of our environment and the needless killing of defenseless animals and harmless plants? I don’t know the answer, but I will keep asking the questions and I hope my readers will as well. Who is responsible for making the decision rergarding the Farallons and how do we contact them? Hi Michelle, Island Conservation has a new CEO, Karen Poiani. She came from The Nature Conservancy, which has been a funding source for island eradication projects. TNC provided funding for both Rat Island and Palmyra Atoll. Thank you so much for this. It is heart-breaking, all the deaths and suffering that the nativists are causing around the world. Of course native peoples altered their environment, but often much less destructively than Europeans because they were aware of how connected they were/are to their environment. The Kiore (Polynesian rat) was brought to Aotearoa/New Zealand by the Maori people, as a possible food source, but knowing how much rats and humans can love each other, as likely companions. They did not bring the animals that the Europeans brought across the world that wiped out entire species though or the domesticated grazing animals that alter the land and plants so much. It’s interesting that the animals targeted for torture and death are never those that benefit humans even though they do worse damage. That alone shows typical nativist hypocrisy. Many animals also deliberately affect their environment, like the many rodent species who plant entire forests with nuts that do not spread too far from their mother tree. Some animal and tree species, like ants and acacias, have elaborate relationships that benefit both beings. It’s bad enough what devastation that humans are doing to already extensively polluted and damaged lands, but so much worse in a relatively pristine environment or small places like the Farallon Islands. There is no excuse ever to poison animals and environments like this. I wish we had a say in this and could stop this horror. Scapegoating, like of rats, is convenient to obscure what humans have done. The beautiful little Kiore is said to be the third most widespread rat after Rattus Rattus and Rattus Norvegicus, but is not an overbreeding problem or they would have wiped out the fauna of NZ as well as animals on other Polynesian islands, like Hawai’i. Massive extinction occurred when Europeans invaded and brought not only predators, but mosquitos that did not previously exist on Pacific islands. In Hawai’i, they spread a bird form of malaria that killed many species, except the few who survived in the mountains above where the mosquitos could go. Another lesson learned from mass poisoning of animals in NZ is that most bird are omnivores and of course will eat poisoned bait. Since birds filled almost all ecological niches where mammals were in other parts of the world, many NZ birds are omnivores. So using poison with meat will target and kill some of the rarest birds in the world. Shooting them, as people have done the magnificent Kea, does not help either. But sea and other birds at the Farallons in the the US are also carnivorous. Most people don’t realize that Turkey Vultures prey on eggs and chicks of other birds, but the way to really tell is to see which species are mobbed by nesting birds. Vultures, like hawks, crows, etc. are chased and have their feathers pulled out (and hawks do the same to eagles, etc. ), but no one worries about osprey since they hunt only fish. The birds know and we can learn from them. Most importantly, they would never manufacture or use poisons in the environment.